Brand New 6BR/6BA Beach Home with Private Pool - Incredible! Great Beach Access! This house is professionally furnished and decorated, a pure designer dream home with top of the line amenities. Right in front of the house is a stunning pool and deck area, great for the kids and family when not at the beach. The home has an elevator from ground level to third floor, a necessity for the mobility challenged in your group. It has a private outdoor shower. There is abundant outdoor space for the sun worshipers in the group and many covered porches and decks for those wanting shade. This house lacks nothing and is a first choice destination for families, friends, wedding parties, and corporate outings. 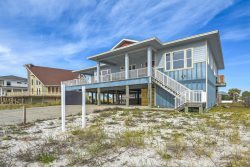 The first floor has an open concept living, dining, and kitchen area all with stunning beach views. The kitchen is a chef’s dream, completely stocked and ready for preparing meals for a crowd. Dining space in provided both indoors and out so guests can be comfortable in any weather. The living area has a large flat screen TV which can be viewed from the kitchen and dining also. For the more serious TV viewer, there is another lounge on the second floor with four swivel chairs, wet bar, and flat screen. All bedrooms also have a TV. This incredible vacation home has six bedrooms and six bathrooms. The main floor has two bedrooms. One has a king bed with private bath. The other has a queen and twin and opens to a shared hall bath. The second floor and a true master suite with a king bed and luxurious master bath with double vanities, soaking tub and walk in shower. This master has glass sliders that open onto a large covered porch with rockers for enjoying the amazing gulf views. The second floor has three more bedrooms. There is a fantastic bunk room with one queen and five twins! This room has a private bath with large walk in shower. The fifth bedroom has one queen with private bath and the sixth bedroom has two full beds and opens to the hall bath. The second floor lounge also has three built in twin bunks which share the hall bath. There is also a sleeper sofa in the main floor living room. Wow! This house really does sleep 25. These first two floors are beyond beautiful and have fantastic views, but the ultimate spot in this home is the third floor! This is the place for morning coffee, afternoon drinks, and evening sunsets. Here you can choose from the cozy glass enclosed nook with loungers or the open air deck. Whichever you choose, you will have views that most only dream of! Don’t miss the opportunity to stay in this property. Book now so your dates don’t get taken. This property will be a spring and summer sell out. It is a beautiful property..views are awesome! House is decorated beautifully. We have been coming to Pensacola with our family for years..this is our favorite home by far and we will be staying again in the future!! From the very first contact with the builder/owner when he actually called me to discuss what I was looking for in a home to the quick response to a text message, the service was fabulous !! This home was beautiful. The photos don't do it justice. Very good location, easy access to the beach and all that Pensacola Beach offers !! Will definitely stay here again!! Everything was great and as expected but I sent a text as instructed for problems when the hot water heater tripped. This was our only issue. Everything else was top notch! Love love love the house. Our family of 9 adults and 6 kids (age 6-15) was very comfortable here. The bunk rooms were awesome and we had room to spare. The pool was great as well. The walk to the beach is about 50 yards. We used a chair rental company to decrease the amount of things we would have to carry out there and that worked perfectly. We will definitely look at this house again for our next family vacation. The staff was friendly and helpful. Any questions we had were answered in a timely fashion. Even the cleaning lady at check out time was all smiles. Way to go! Our family enjoyed the stay so much that we will be back again. The price was right as well as all the furnishings and cleanliness. Love your southern hospitality!